Well, I tried. I tried to climb the hill on US 22, but I just couldn't do it. So this would be northeast on Gilbert Avenue (US 22/OH 3) as it goes over I-71. It has a bike lane here, and up ahead is the HQ of (brrring!) Channel 9 - formerly the Natural History Museum. Southwest on Reading Road (US 42). 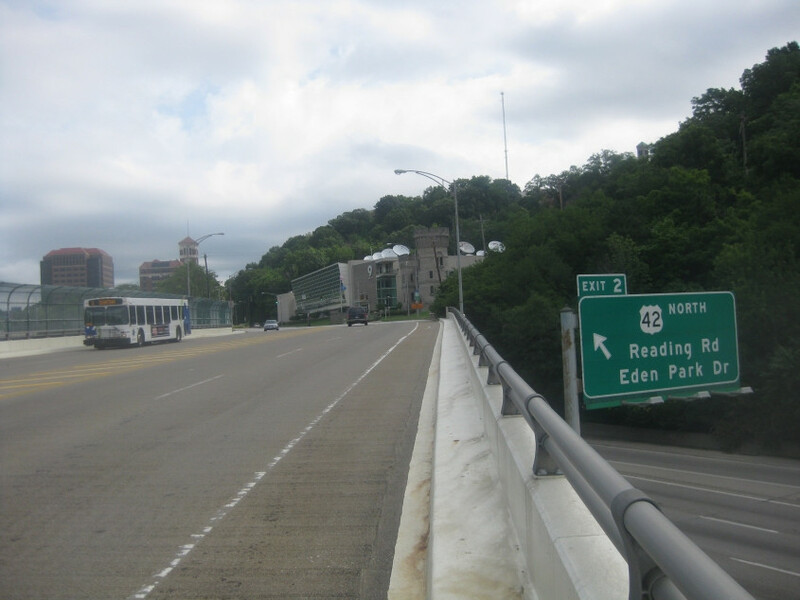 The road is a one-way split here, and the traffic island on the left goes to the more freeway-like northbound side. Dandridge Street off Reading Road. 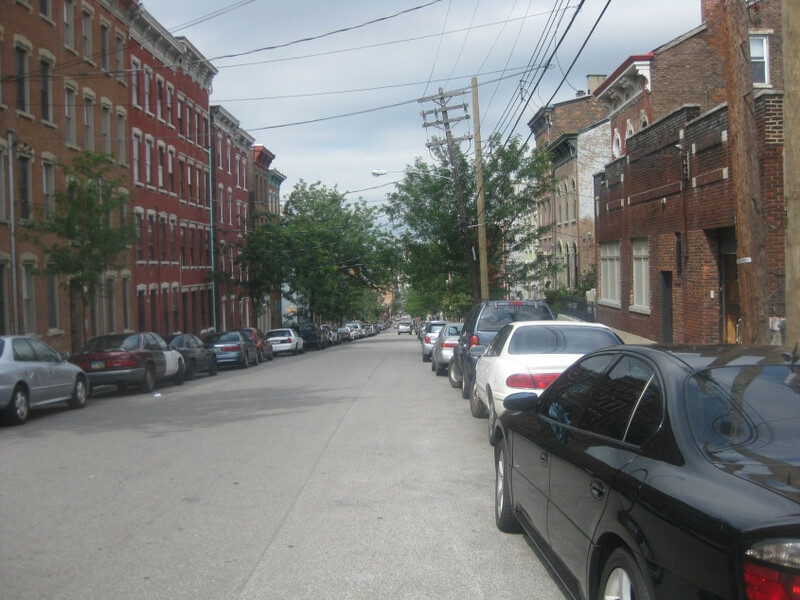 This street used to connect with the stretch of Dandridge on the other side of Liberty Street. West on 6th from Race Street. The street goes under part of a building up ahead. I think it's part of the Skywalk, but it also appears to be part of the Millennium Hotel. East on 7th at Walnut Street. Notice how the lettering for the Weston Art Gallery uses the Sesame Street font. East on Freedom Way from Walnut. 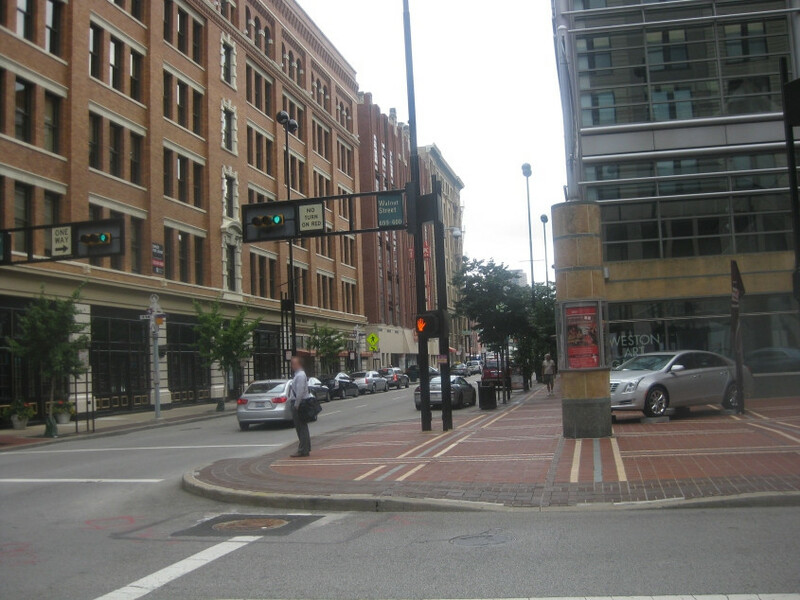 This street dates only from the 2000s or 2010s, but it looks like a regular downtown street. It now connects rather seamlessly with the rest of downtown. 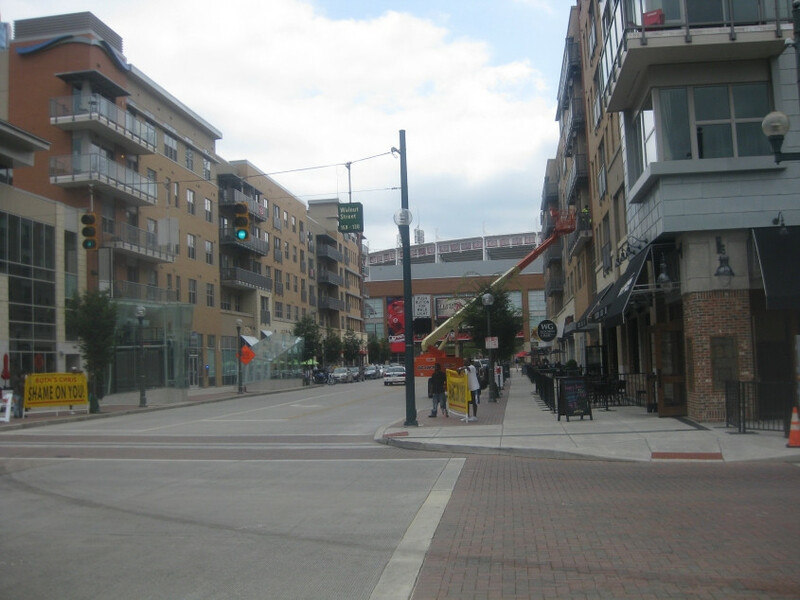 The street is just a teensy-weensy bit south of the old 2nd Street that became Pete Rose Way. 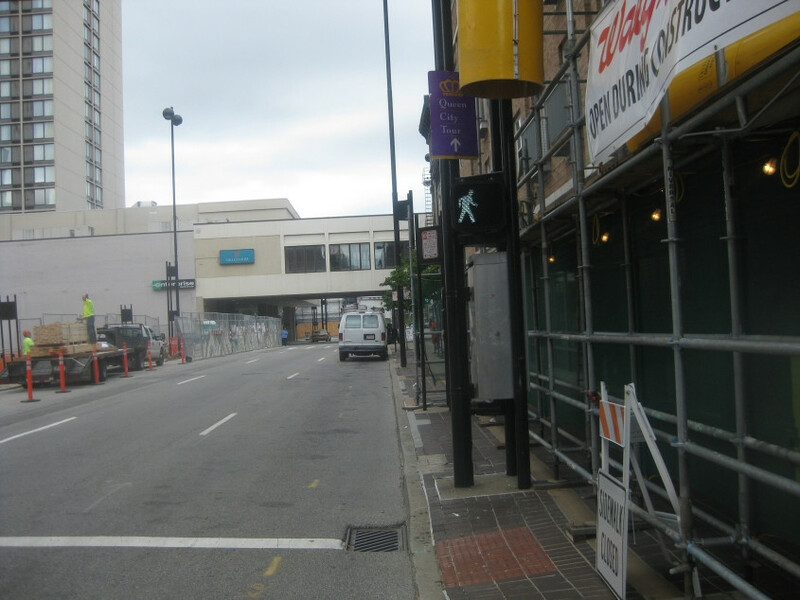 The now-defunct stretch of Pete Rose Way would be buried under the buildings at left. The street level here is actually much higher than it used to be. Looking west from the east walkway of the Suspension Bridge. 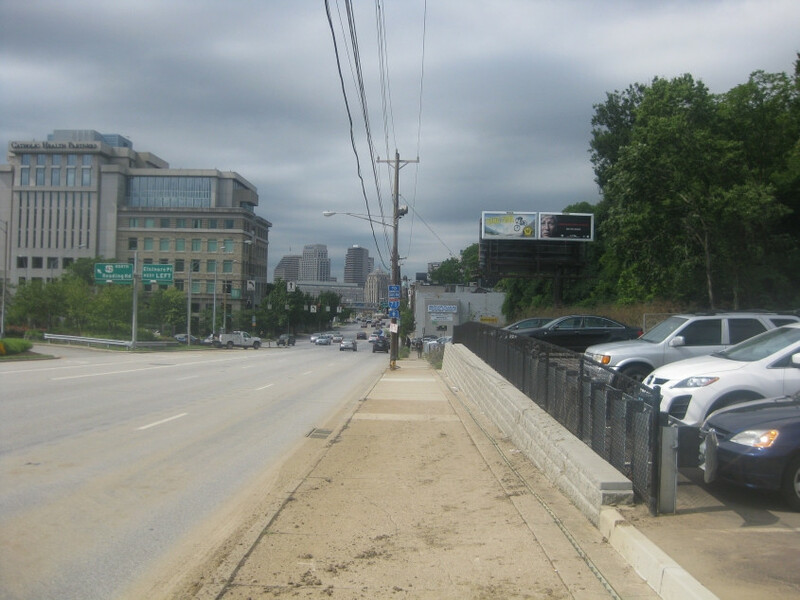 The road straight ahead with the dumpster is the old Mehring Way. 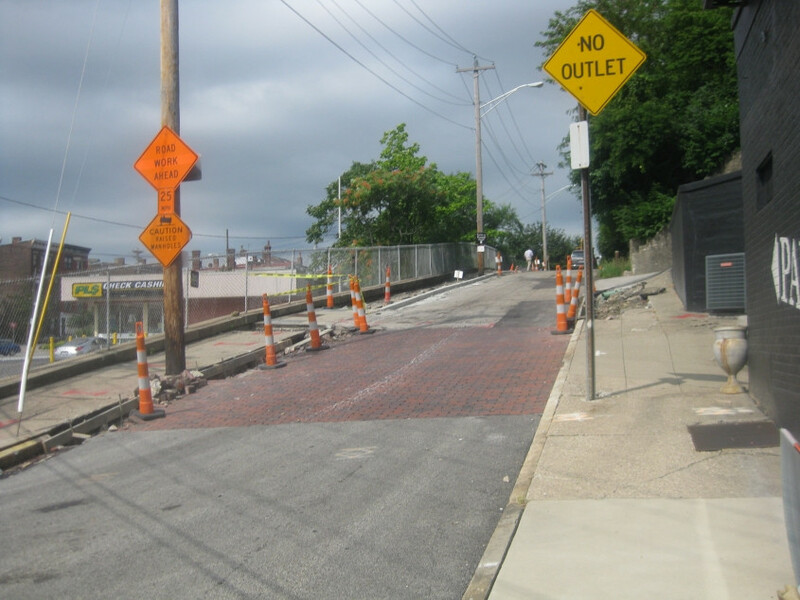 The new Mehring Way is on the right. 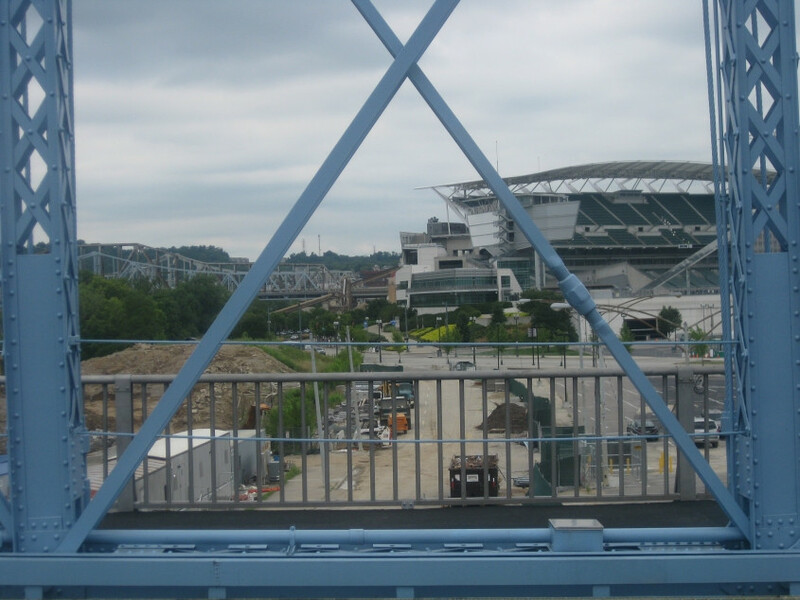 You can also see Paul Brown Stadium, the Clay Wade Bailey Bridge, the C&O Bridge, and the Brent Spence Bridge. Looking east from the Suspension Bridge. 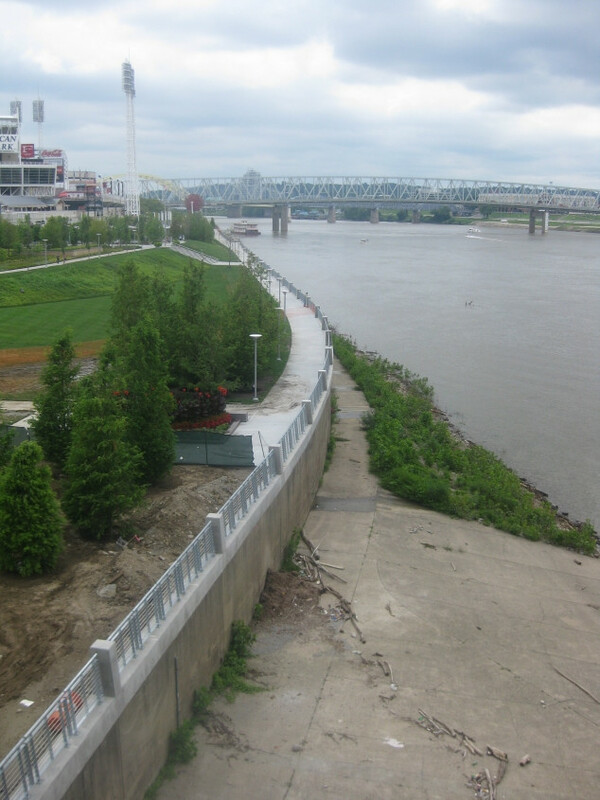 What's of interest here is the wall where it looks like they've built a new path. Then there's also what looks like a path at the bottom of the wall. It also appears from aerial photos that parts of the lower path are usually flooded, so I'm not sure how to get to it. The plot thickens. 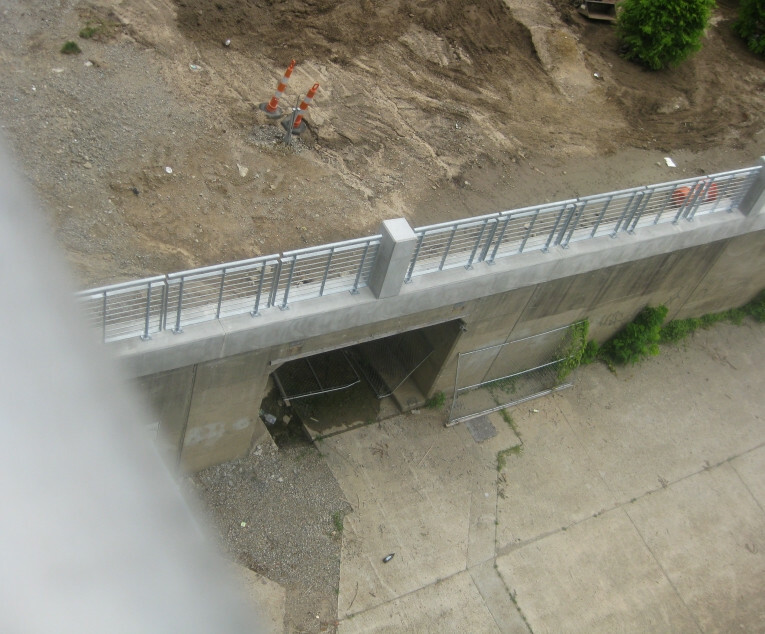 The lower path described above has this tunnel just east of where the Suspension Bridge approach is. 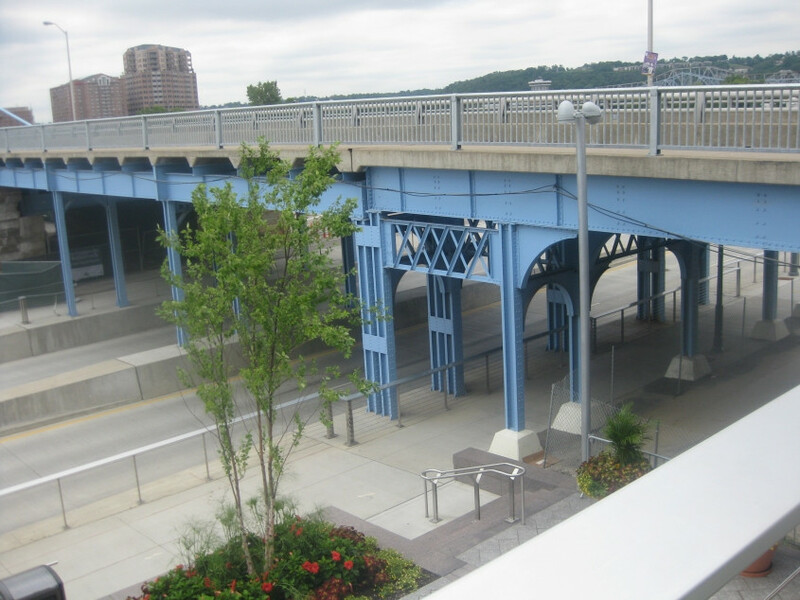 It appears as if the tunnel goes under the old Mehring Way and up into a parking lot. 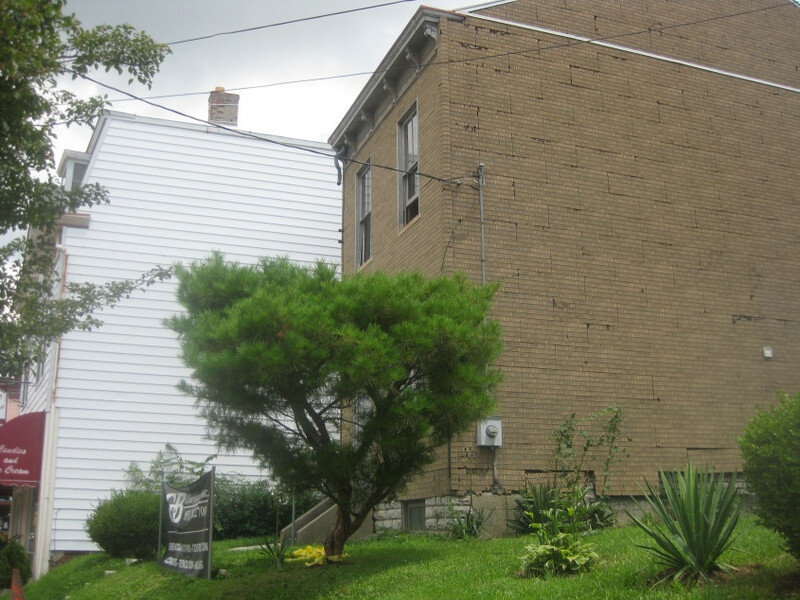 This house on Fairfield Avenue in Bellevue, KY, was slated for demolition the very day of this photo.